Located on the gulf of Finland, Estonia’s capital of Tallinn is best known for it’s ‘Old Town’, one of Europe’s best-preserved medieval cities. A couple of year’s ago I visited the Eastern European capital with zero expectations when it came to custom motorcycle workshops. However, after a chance encounter with a friendly local, I ended up at the workshop of Renard Motorcycles. Workshop front man Andres Uibomae is an industrial designer who over the past few years has been working to launch his own motorcycle named the ‘Renard GT’. Powered by a Quattrovalvole Moto Guzzi engine and featuring a carbon fibre monocoque frame, the GT resembles something you’d expect to see on the set of Blade Runner rather than on the streets of a medieval city. Along with developing his own motorcycle Andres and his team build outstanding custom motorcycles and their latest creation is as unique as their GT. 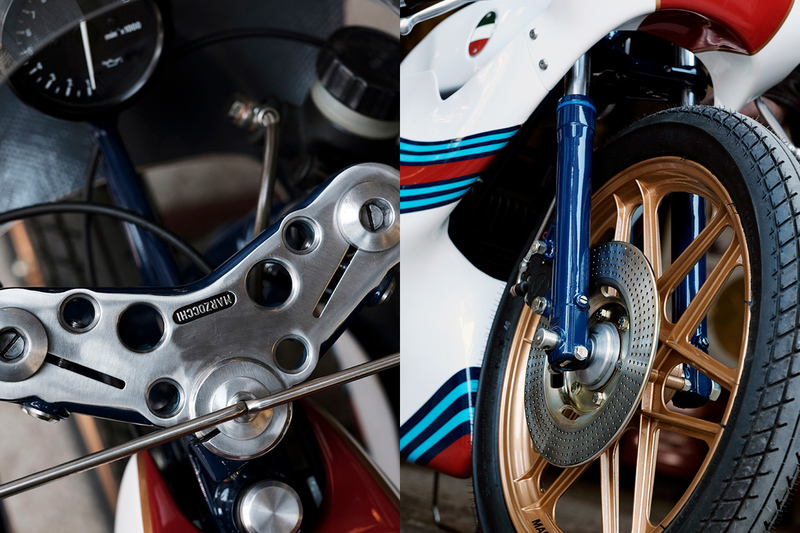 Unlike the GT though, the Renard ‘Martini Racer’ took inspiration from classic race bikes and beneath its fairing lies an Italian engine that most people are unlikely to recognise. ROCR: Hi Andres, What’s been happening at Renard since we last spoke? Andres: I guess the biggest change is that we moved to an old Train depot building in the Telliskivi district, which is an old industrial block near the city centre. We have a really cool garage which is much bigger than the one before. As part of the space, we have a custom parts store, a coffee shop, a record store, a barber shop and more. It is a true petrolhead mecca! At the end of May, we will go to the BikeShed London 2017 to display our bikes. After, that we will go to Italy, as the Renard GT won the A’Disain award’s Platinum prize. Then I would love to finish my own bike! R: Where did your inspiration for the Martini Racer come from? 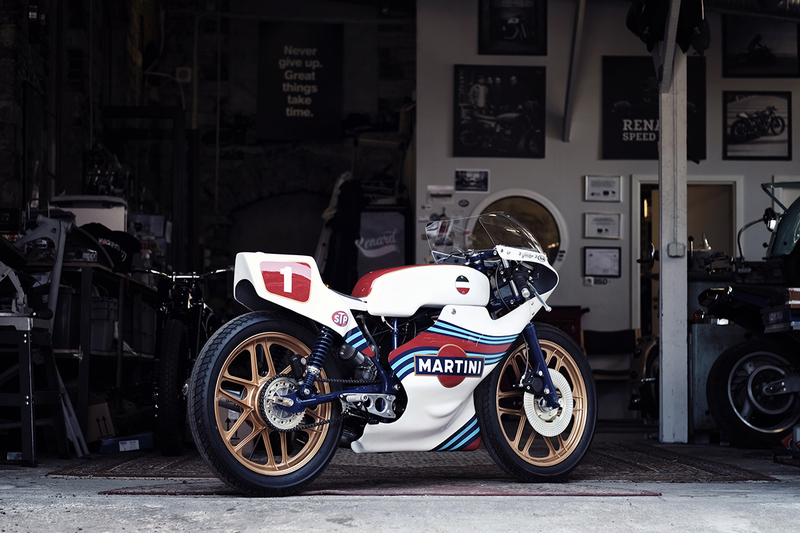 A: For a long time I have been wanting to build a racing replica style bike, and now I finally had this great opportunity. 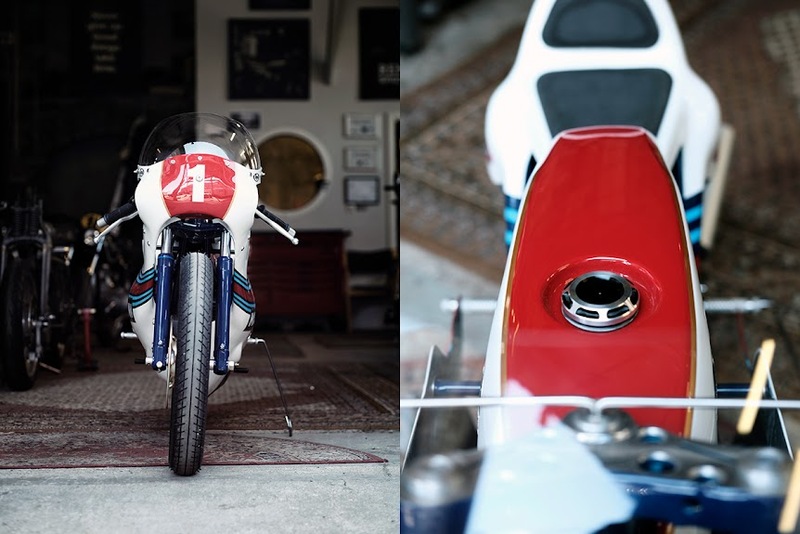 Two-strokes have always been a favourite of mine. With this project, everything came together nicely and it was real fun making it. R: Where did you find the rather unusual donor bike? 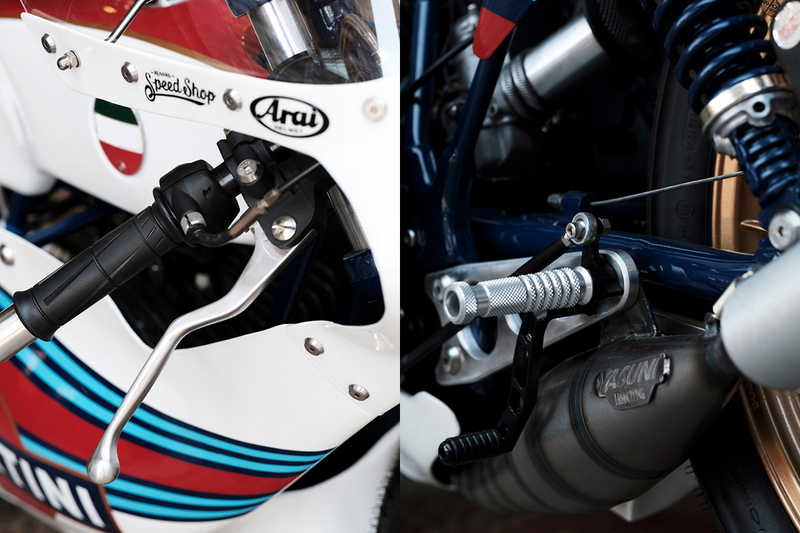 A: It’s an Italian SWM RZ 124. The bike we found was practically new with only 7 km on the clock. This bike’s story is very similar to our other builds. We found it in Germany, in a shed where it had been standing for the past 35 years. We loaded it into our van and brought it back to the workshop where we immediately began chopping it into pieces! R: Can you walk us through the build process? A: As this is a replica and not meant for racing we took a more of a creative view on it and cut a few corners here and there. The donor bike was as good as new, so we didn’t do anything with the engine. We fired it up and it ran perfectly so we left all that stock. The lights and all other unnecessary things were thrown away. The rims and brakes were left as they were but the front brake disk was drilled to make it look a bit cooler. The rear shocks were replaced with shorter ones and the front suspension got redone to make the bikes stance right. 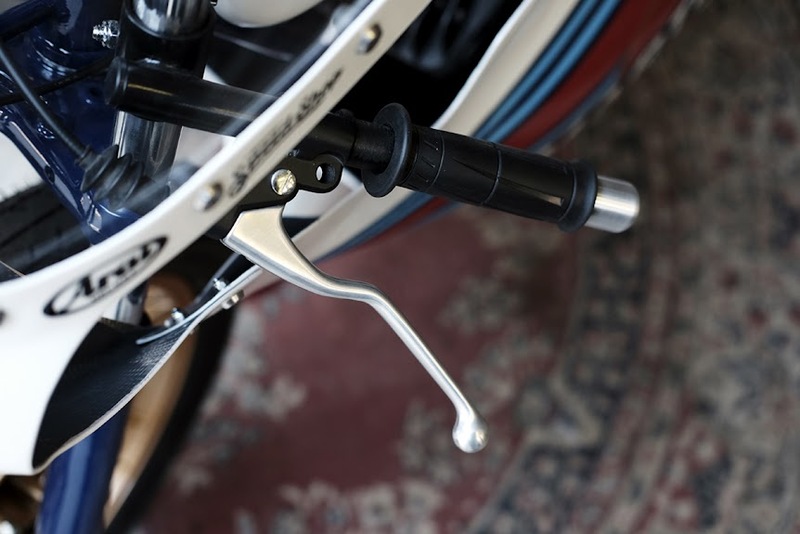 The new foot pegs and mounts were all designed and made in the Renard workshop, as well as the shifter system. We found the muffler in a moped shop and it’s a Yasuni racing item that sounds great. For the rubber, we went with a set of classic Continental TKV 11. I had an old Russian Minsk racing tank lying around the workshop. Its shape and length fit perfectly and it was straight so we fit it to the frame. All that was left to do then was find some fairings for the bike that fit the time period we were after. Unfortunately, when the bodywork we found arrived we discovered it was way too small for the SWN frame. We spent a long time cutting them into pieces and sticking them back together making room for everything to fit. 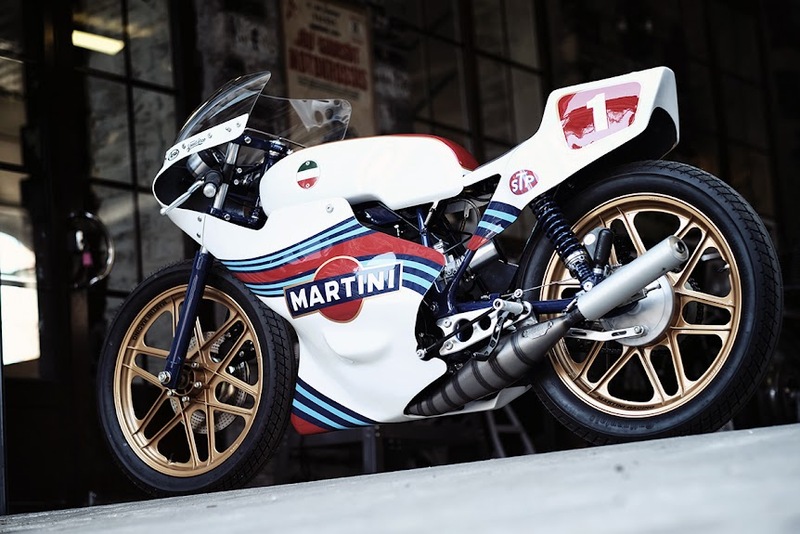 Once it was all sitting right the Martini Racing paint scheme was chosen as it is true to the era and in our mind more clean and classy than Gulf or Marlboro. R: How does it ride and where will it be ridden? A: To be honest we haven’t had the chance to test it yet! Just as we finished the Racer it began snowing in Tallinn. I guess that’s a pretty good excuse! When we finally have the chance we will expose the bike to some fresh air. Because it’s not street legal (missing the lights and all) we will probably have to take it to a special track to break it in. The coolest thing about it now is it’s so small and weighs almost nothing. Moving it around the workshop is like pushing a toy around so we’re all really excited about how it is going to ride. Previous Post Renard Speed Shop is going to London!